Comfortably Read: K.A. Young - Double Release!!! DOUBLE RELEASE - AVAILABLE NOW! Warrior Redeemed (Nephilim Warrior, #4)Nyoka believed that he'd run as far and as long as he was able. Feeling beyond redemption he decides to end it all. A young woman full of hope and courage stumbles upon the hopeless warrior on her quest to change the world by reversing the horrific effects of the yetzer hara. Igniting his instincts to provide and protect, she pulls him back from the brink of the abyss. Can this warrior let go of his past to embrace love and redemption? 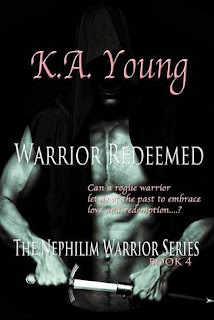 Not familiar with The Nephilim Warrior Series? Download Book 1 for FREE!